Hershey, PA, December 8, 2018 – Mike Sgarbossa and Liam O’Brien scored two goals apiece Saturday night at Giant Center, to lead the Hershey Bears to a 6-3 win over the Hartford Wolf Pack. Bobby Butler and Vinni Lettieri had a goal and an assist each for the Wolf Pack, and Vince Pedrie had two assists. Colby Williams added three assists for Hershey. The Wolf Pack opened the scoring three minutes into the game, on a power-play goal by Butler. With O’Brien in the penalty box for tripping, Lettieri moved the puck across the Bear line and handed to Tim Gettinger on the left-wing boards. He fed across to Butler, who fired home a shot from the right side of the slot. Hershey equalized at 13:20. The Wolf Pack won a defensive-zone draw, but couldn’t clear the puck, and a shot from the left point by Williams was tipped by Nathan Walker, and it hit the inside of the goal post to the left of Hartford goaltender Alexandar Georgiev (31 saves). Sgarbossa got to the carom in the goal mouth and pushed it into the net. The Bears jumped in front for the first time 3:27 into the second period, on the first North American pro goal for Maxmilian Kammerer. After Hartford’s Peter Holland was dragged down near the blue line trying to move the puck out of the zone, Mason Mitchell passed to Williams, and he worked a give-and-go with Kammerer, who finished the play from the right side. The Wolf Pack man advantage clicked again to tie the score at 10:31, with Walker in the penalty box for hooking. Butler got the puck off the right-wing boards to Pedrie at the point, and he set Lettieri up at the top of the left circle for a one-timer. That shot beat Hershey netminder Ilya Samsonov (28 saves) to the glove side. The Hershey power play responded, though, on its first opportunity of the game, at 17:11. Connor Hobbs prevented Shawn O’Donnell’s clearing attempt at the right point and handed across to the opposite point to Williams. He quickly whipped a pass to the front of the net, and O’Brien, headed to the middle from the right side, deflected the puck past Georgiev. The Bears then broke the game open with three goals in the third, starting with O’Brien’s second of the game at 6:30. O’Brien carried into the Wolf Pack zone on left wing and got to the middle with an outside-inside move, before losing the puck. He got back to it on the right side, though, got his stick loose and put a backhanded swipe into the net. Garrett Pilon made it 5-2 for Hershey in a 4-on-4 at 10:13, with his first pro goal. He worked his way free along the goal line on left wing and stickhandled toward the front, before flicking a shot by Georgiev on the glove side. Sgarbossa then got his second of the game on a power-play deflection at 11:38, after a slashing call against Georgiev 12 seconds earlier. Former Wolf Pack Jayson Megna played the puck from near the left-wing corner out to Aaron Ness high in the slot, and Sgarbossa tipped Ness’ snap shot into the net. The Wolf Pack cut the margin to 6-3 with 4:33 left, with Alex Kile scoring his first Wolf Pack goal. Pedrie centered the puck from the right-wing corner, and it went off of O’Donnell at the side of the goal and deflected to the front. Kile, playing his second game up from Maine of the ECHL, drove the middle and knocked the loose puck in. The Wolf Pack’s next game is this Thursday night, December 13, the first of two games against the Charlotte Checkers at Bojangles’ Coliseum in Charlotte. Faceoff is 7:00 PM, and all of the action can be heard live on News Radio 1410 WPOP, and on-line at www.newsradio1410.com and iHeartRadio. Video streaming is available at theahl.com/AHLTV. 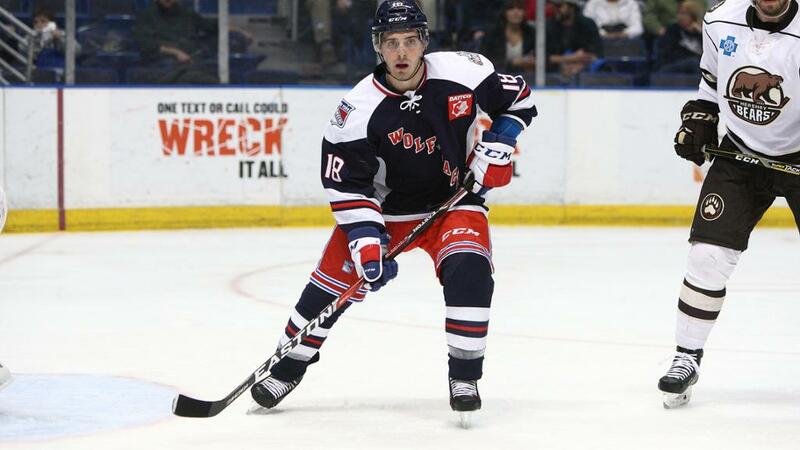 The next home game for the Wolf Pack is Wednesday, December 19, when they host the Providence Bruins at 7:00 PM. That is another chance to take advantage of the Wolf Pack’s “Click It or Ticket Family Value Pack”, which includes two tickets, two hot dogs and two sodas, all for just $40. 1st Period-1, Hartford, Butler 5 (Gettinger, Lettieri), 3:00 (PP). 2, Hershey, Sgarbossa 10 (Walker, Williams), 13:20. Penalties-O’Brien Her (tripping), 2:10; Gilmour Hfd (instigating, fighting, misconduct – instigating), 15:37; Malenstyn Her (fighting, match – check to the head), 15:37. 2nd Period-3, Hershey, Kammerer 1 (Williams, Mitchell), 3:27. 4, Hartford, Lettieri 4 (Pedrie, Butler), 10:31 (PP). 5, Hershey, O’Brien 10 (Williams, Hobbs), 17:11 (PP). Penalties-Walker Her (hooking), 9:09; Gettinger Hfd (holding), 15:17. 3rd Period-6, Hershey, O’Brien 11 (Lewington, Kammerer), 6:30. 7, Hershey, Pilon 1 (Geisser, Lewington), 10:13. 8, Hershey, Sgarbossa 11 (Ness, Megna), 11:38 (PP). 9, Hartford, Kile 1 (O’Donnell, Pedrie), 15:27. Penalties-Williams Her (holding), 8:33; Lettieri Hfd (holding), 9:27; Georgiev Hfd (slashing), 11:26; served by Lettieri Hfd (bench minor – too many men), 16:46. Shots on Goal-Hartford 12-14-5-31. Hershey 17-11-9-37. Power Play Opportunities-Hartford 2 / 4; Hershey 2 / 4. Goalies-Hartford, Georgiev 2-4-0 (37 shots-31 saves). Hershey, Samsonov 4-8-0 (31 shots-28 saves). Referees-Alex Ross (7), Peter Tarnaris (17). Linesmen-Richard Jondo (55), Colin Gates (3).